On Sunday I attended Solemn Vespers at Worth Abbey Church which has just reopened after a major refurbishment of the never finished interior of architect Frances Pollens’ grade 1 listed 1960’s church and the installation of new furniture designed by Thomas Heatherwick. 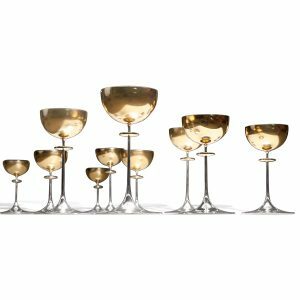 As part of this project we, at Pruden & Smith were privileged to be asked to design and make a sculptural silver and silver gilt altar set comprising ten chalices of different heights and 3 stacking ciboria. In 2008 Brothers Anthony and Gabriel visited our workshop with a long list of requirements for the soon-to-be-refurbished Worth Abbey Church. They went away rather down-hearted when we totted up the total minimum cost in silver, which had recently started to spiral upwards in price due to the shaky state of the financial markets. I was both surprised and pleased to have a phone call a year later to say that Worth would like to go ahead and begin the design process as funds were now available thanks to the Friends of Worth. An obvious place to start designing from was the date and distinctive design of the church building. But on seeing the new plans for the interior, the furniture design by Thomas Heatherwick and in discussion with Father Christopher, the brief for the refurbishment was clearly to create a lasting contemporary interior that regenerated the unfinished aspects of the church to bring it into the 21st century. The space inside the church is dramatic with the altar as the focal point. The doors, walkways and seating serve to keep your attention on this one place at all times. The layout of the circular roof window enhances this and alters the atmosphere in the church with the weather and the time of day: a strong column of light often accentuates the altar in a single spotlight effect. It was clear that it was not just a list of functional vessels that were required for this sacred space but a single sculpture that worked with the altar, the lighting and the church building to further enhance its meditative focus, drama and sense of wonder. This was created by giving the ten repeated chalice forms different heights to start to break up their uniformity. To transform their form the base was flattened to the altar top, the stem reduced to be as slender as possible and the knop almost flattened out of existence with the intention of having the lower section of the chalice disappear to leave the chalice bowls floating above the altar in a cloud form. After experimenting with different finishes on silver in the light of the church, silver was chosen for the bases for its mirror reflectivity that enhanced the disappearance of the base and stem. It was lightly brushed to bring down any visible contrast. 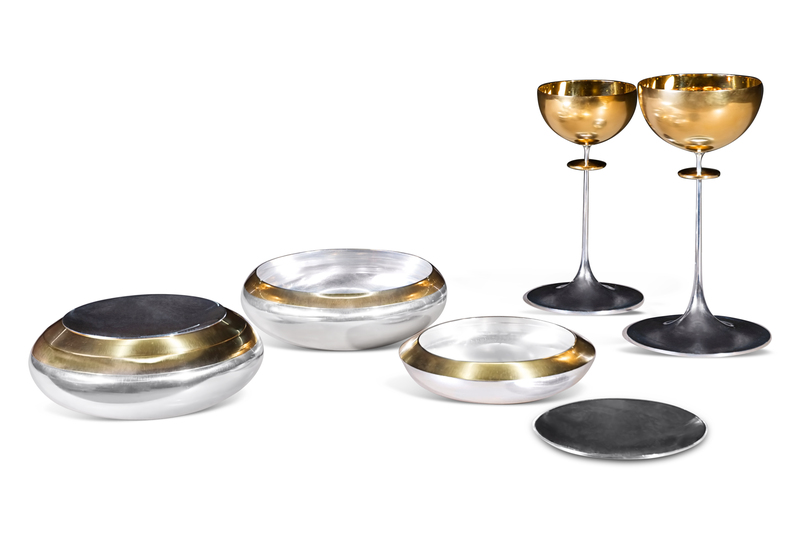 Brushed silver gilt was used for the bowls giving them a golden shimmering visibility. The design is repeated at a lower level by the three sets of ciboria. These separate into nine receptacles but assemble into three stacking pebble shapes that lie at low level beneath the chalice bowl “cloud”. They are gilded at the rim and silver below, the shape created by the gilt parts is a flattened reflection of the bowls above. The finish was achieved by bright polishing, “butler brushing” then gold plating and “butler brushing again until the surface had the right reflective level. Attached is a computer render of the design. We have commissioned Tomek Henke of Henke Images to photograph the chalices and ciboria now that the interior is complete. My thanks to all those who helped to make this commission possible especially to the friends of Worth Abbey for their tireless fundraising. 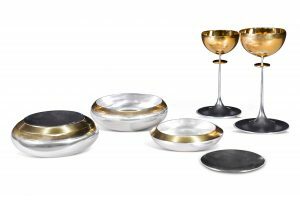 Rebecca Smith, Designer, Worth Abbey Altar Set, Pruden and Smith.